I have full Mavic wheels on my Specialized S-Works Pro Hardtail, I upgraded to Mavic Rims and Hubs and the bike is screaming fast and light. The rims have some flex to them, but overall I am very pleased. Now I have not tired to use this digital wireless transmitter, but I have the bike shop looking to hook me up. With the interface and easy of use what more could you ask for from a company that produces nothing but quality products. Using an exclusive Mavic® coded digital transmission technology, Win-TechÂ® is lightweight and easy to use. It can be fitted to any bike and receive up to 9 stats. No cables, no interference, just a clean bike with completely integrated elements. At first I though hey this is such hype, but leave it to Nike to spend millions on developing a sneaker that make it feel as though you are running bare foot. Nike sponsor many college and while visiting, they notice they were training in their shoes but racing bare foot, this got Nike to thinking and BLAM, Nike Free. Now I have not tried the shoes but I will, after reading a great article in the NY Times this morning about running bare foot. "The idea for the Free was born after two Nike researchers, visiting the Stanford track team, found that their sponsored runners ran sprints barefoot. Vin Lananna, their coach, had encouraged them to take off their shoes. "I felt that as shoes became more elaborate and intricate, the feet were getting weaker," said Mr. Lananna, who is now director of athletics at Oberlin College in Ohio. 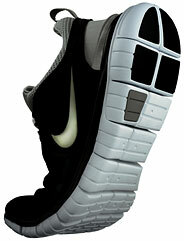 Mr. Lananna had always outfitted his team in Nike's cheapest and least structured shoe. The one time he experimented with Nike's best, his team was plagued by plantar fasciitis and Achilles problems. He now likes his runners to use the Frees." A little restraint goes a long way, so it would seem. For those who have no self control or a family that is way to crazy, here is the solution. I was reading the NYTimes this morning, and in the new reduced circuits section was an article about this egg that helps control how fast you eat, the slower you eat and your mind has an opportunity to adjust and say "hey I'm full". It was also being used to help control your family and have a peaceful meal together, like in the old days. Give me a break, how about a little control over yourself and family, my god pull yourself together. Here is another example of how technology is helping improve peoples lives. The next couple of years we are going to see numerous device that can monitor many body functions that right now we need to go see a doctor or prick our finger to get the results. "A wrist-watch-like Glucoband, with fully integrated LCD screen, electronic circuits, integrated electrodes, battery and adjustable wrist-band, is placed on the person's wrist. The initial measurement process takes only a few minutes, however, in the monitoring mode, measurements can be continuous and only the frequency of measurements must be determined. The Glucoband targets diabetics who are measuring their own blood glucose, and medical personnel who are using blood glucose measuring and monitoring devices in clinics, hospitals and other point-of-care facilities. The measurements meet FDA requirements for accuracy and correlation." I am a bit of a watch nut, I like all kinds fancy, low tech and ones full of technology. For running, biking and xterra type events, nothing comes close to Polar. I have tried the Suunto X6HR and returned it 4 times within the year. Suunto claimed to have had a bug in a certain batch but I could not handle loosing data and the watch always resetting itself. The best thing about it was the interface with the PC, transfering data was easy and quick, now on the Polar this is one of my biggest complaints, the IrDA should work a little better, but after a couple of tries it hooks up. I use the Polar AXN700™ and this thing is bullet proof, if you are looking for a watch that can handle 90% of what the general public will put it through this is the one, it also competes with Suunto X6HR. It has vertical speed, barometer, fit test, compass and heart rate test. I could go into more but Polar AXN700™ will describe it better and in more detail. The other one, Polar S625X™ Running Computer is great!! Hands down great for triathlons. I have not gotten the bike mount yet but the foot pod once calculated is dead on. Has the same features as the AXN700™, but a different configuration in the setup and file structure. 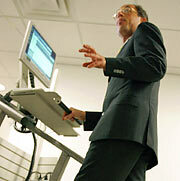 Well someone has done it, you can now walk on a treadmill and surf the web, answer email and talk on the phone. The treadmill moves fast enough to raise your heart rate but not sweat. This could be my office tomorrow, "Instead of being sedentary in front of their computers, they'd stand. But instead of standing still, they'd walk on a treadmill. And instead of meeting around a conference table, they'd talk business while walking laps on a track. That's exactly how Levine, a Mayo Clinic obesity researcher, and several of his colleagues have been working for the past five weeks or so. "I hate going to the gym, which may be partly why I'm so interested in this," he said, keeping up a 1 mph pace on his treadmill while checking e-mail and fielding questions from a reporter. Not what you are thinking, but this low tech forearm/grip strengthen device is much better then the old squeeze grip spring device. The Dynaflex Pro Plus is a carpal tunnel saver and helps when you are board watching TV. Doing it in the office is a bit much,but holding on for 10 minutes is quite difficult. I have an original (the one without the rubber around it) and also a newer one. I like them both but once it get dirty and you lose the string it is really tough to start. Omron Body Logic Body Fat Analyzer HBF-306BL, I used this a while back and I guess since my body fat was to low that it had trouble giving me a reading. For the average person looking to see results and track weight and fat, this device seemed very accurate, others that were with me tried it and it seemed to be dead on. They say that it should be used with a scale if you would like to see the best results. I had heard about his a couple years ago and now it's becoming a market. The idea is simple enough and when applied to a exercise routine, you start to see results. "How can this possibly work? How can you get a workout standing absolutely still? "Position 1: Stand in the doorway with your buns against one side of the frame and your hands on the other. Now push with all your might! While you're pushing, you should feel the effort in your triceps, deltoids, and abs. Position 2: Hold onto the doorframe and pull with everything you've got. You should feel that in your biceps, lats and glutes. Position 3: Brace your legs out wide, and push the doorframe left and then right. You should feel this in your quads, your core stabilizers, and your shoulders. Now repeat the above exercises for 30 minutes, constantly changing between Positions 1, 2, and 3."